Address Plaque with Sailboat - - wall mount sailing theme address sign personalized with the address number and street name you supply. Made in USA. Estate size 23.25" x 14" arch sign includes a sailboat inside the arch, large house numbers for good visibility, and a one line or two line address. Line 1 holds up to six (6) 4.5" numbers. Line 2 holds up to twenty-one (21) characters. If you are ordering a one line sign, leave the Line 2 input box empty. Colors: BG black/gold, BW black/white, DG dark blue/gold, DW dark blue/white. Large image shown in dark/blue/gold. Smaller images colors (from left to right) are antique brass, antique copper, black/gold, bronze verde, oil rubbed bronze, bronze/gold, and pewter/silver. Manufactured from high-density aluminum alloy and protected by Alumi-Shield™ all weather coating. Alumi-Shield™ protects against the harshest weather and environmental elements and extends the product life. Dimensions: 23.25" x 14" x .375"; weighs 6 pounds. Cleaning and care: Use a non-abrasive detergent and water with a cloth, sponge, or soft brush. 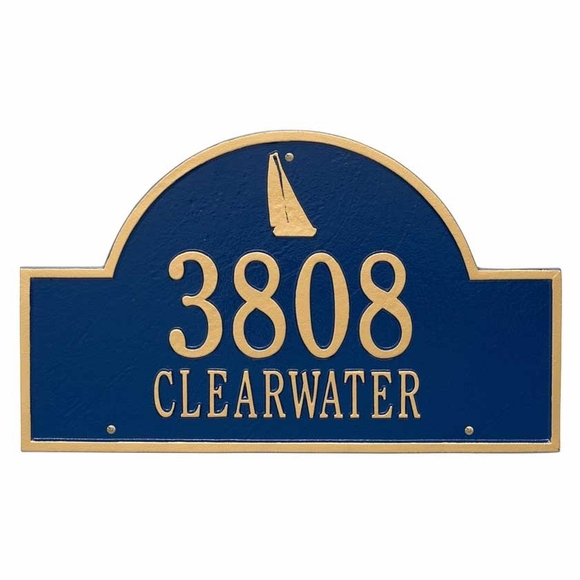 Address Plaque with Sailboat estate size sign with your address number and street name. Custom made in USA.